In the projects I have worked so far, Milestone Charts (also known as timeline charts) are often one of the most discussed parts. A commitment to deliver is as important as the project itself. 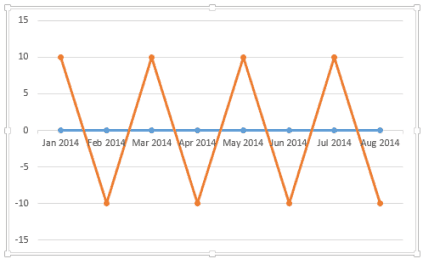 A milestone chart is an effective tool to depict project scope and timelines. In this post, I will show you a simple technique to quickly generate a Milestone chart in Excel. Get the data in place. 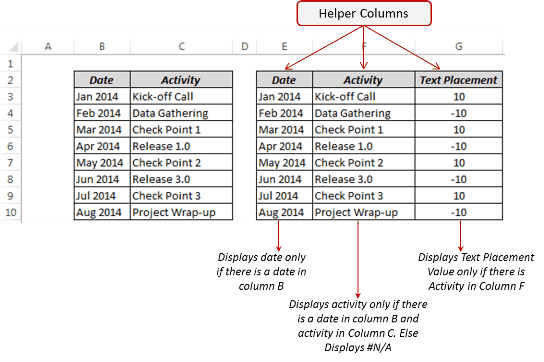 To create this, I have two columns of data (Date in B3:B10 and Activity in C3:C10) and three helper columns. In the Select Data Source dialogue box, click on Edit in Horizontal (Category) Axis Labels and select dates in Column E. This changes X Axis values to dates. This would introduce a secondary vertical axis on the right of the chart. Click on it and delete it. How to Make a Pareto Chart in Excel. 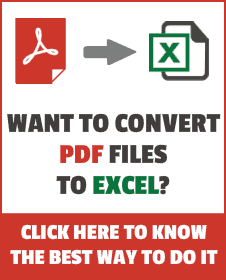 Creating Combination Chart in Excel. 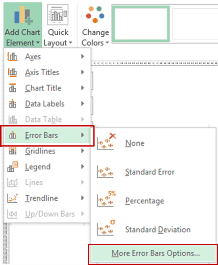 Creating an Area Chart in Excel. Is there a way to use a chart like this but to have subtasks? I’m driving myself crazy trying to learn how to add in a subtask. I was thinking i would resort to hand coloring each task one color then the subtask would match but be a little lighter. But this project will span several years and I really want to avoid and manually coloring each task. Any suggestions? I found it extremely helpful and was able to successfully create it but later when I happen to add any additional date, activity, it messes up the graphic completely. Can I gracefully modify it when a new task/activity has to be added without messing up the graphic? Did you get ever work this out in the end? I’m currently having the same problem. Is there a way for me to insert new events onto the timeline without having to start over again? 1. Add the additional data to your table. 2. Click on one of the long thin lines on the graph which points to the ‘Activity’. 3. You should see that on the table, the data is highlighted in little coloured boxes. Simply drag this down to incorporate the additional data. Click anywhere on the sheet besides the table or graph when the new data has been highlighted to deselect them. 6. 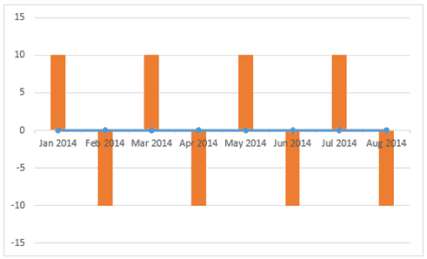 Select ‘Edit’ in the right column (Horizontal Axis Labels) and select all dates, including the new dates. 7. Select ‘Activity’ in the left column and repeat step 6, ensuring all activities are highlighted, including the new activities. 8. Press OK to exit the Data Selection window. That should be it! Just adjust the new labels to be in the correct position and you should be good to go. This is awesome! VERY useful and i shall implement it for my next project!! Thanks for sharing the Template. I will now use this in creating project plans.